Pawlawski poses with his fallow deer. While hunting in New Zealand, Mike Pawlawski met with the All Blacks rugby team, but he had no desire to get out onto the pitch with the world champions. Pawlawski decided to maintain his health for arduous bow hunts in the mountains. He took an Awapara ram, a fallow deer and red stag with a bow, while he set up his guest, Washington State football coach Mike Leach, with Alpine Hunting outfitters on rifle hunts for red stag and tahr. Pawlawski plans two shows from New Zealand, one focusing on red stag while the other heads to great heights for Leach’s tahr. 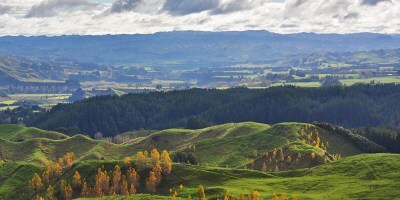 While the hunting was epic, with New Zealand’s incredible topography as picturesque backdrops, he said the most striking thing about the country is the people. “Without a doubt, some of the best people that I’ve met on any of my travels,” Pawlawski said. “They have a sensibility that’s somewhat like I imagine America was like in its formative years. Pawlawski also said he was amazed that the All Blacks asked him about American football. Leach and Pawlawski watched the players practice then dined with coaches and shared some football and rugby culture. The All Blacks coaches even picked his and Leach’s brains in an effort to better their program. “They are always looking to improve what they do,” he said. “They are talking to different coaches about organizational things, about evaluating players, the mentally you take into the game of football. Although he had no advice on retrieving the ball from a scrum, Pawlawski and the coaches came to agreement that teamwork and chemistry are the foundation to building winning teams. And that philosophy carries over to any teamwork situation, like producing a TV show. Possums from Australia were introduced for fur trade, but they have overrun the country. There are 30 million in New Zealand, which is about the size of Colorado, and are public enemy No. 1. Drivers will swerve to hit them, people poison them regularly and hunt them with abandon. Why? Possums kill millions of birds and chicks each year, eat the tastiest parts of trees and have spread bovine tuberculosis to herds, just a blight on the ecosystem. Pawlawski helped quell their numbers in the continuing war against possums that began in 1940s. Click image to see photos of the hunt in New Zealand.